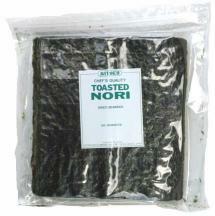 Ingredients: Japanese dried seaweed: Nori (Porphyra Tenera) - Toasted, Chef's Quality. Since the 2011 Tsunami which ruined the our nori crop in the Sendai Region near the Matushima, we have had to switch our suppliers. Our post-tsunami supplier for Nori is located on the western side of Japan in the Ariake Bay, South of Fukuoka Prefecture on the famous island of Kyushu. This area is the only other hand-harvested nori which is still produced using traditional methods. As seaweed thrives in very cold water, our nori is the taken during the winter and is the first harvest. Its raw, tender fronds are then pressed into sheets and then hand-toasted over fire. This is considered to be the finest grade, known as "shin Nori in Japan and rates the highest score given, a ++5 for its remarkable flavor, crispness and beautiful black sheen. In Japan, this grade of nori is called "Ariake no Megumi" meaning, "Gift from the Ariake Sea." Unlike our Fine Quality, Our Chef's Quality Nori comes from the Fall harvest or Second Harvest and is thus a slightly lower grade scoring a +5. It has a lighter hue, a more paper-like texture and milder taste. Versatile and ready to eat, Toasted or "Sushi" Nori is a must for sushi, norimaki (sushi rolls), and rice balls ("onigiri"). Crumbled or cut into strips, it is an attractive garnish for grains, noodles, and soups.